The 2010s has become a decade of nostalgia. Dozens of film and TV properties from 20 plus years ago have been revived, rebooted, or given an arguably unnecessary sequel. This newest venture into the age of reboots is none other than the Mighty Morphin Power Rangers. Created by Haim Saban in 1993, the Mighty Morphin Power Rangers drew it’s inspiration (and also footage) from the popular Japanese series Super Sentai. The superhero series told the story five teenagers: Jason, Zack, Billy, Kimberly, and Trini; who are called upon by the mystical alien Zordon to fight against the witch Rita Repulsa and her forces of evil. Nearly pulled from the schedule by Fox due to the network having little faith in the series, the Power Rangers became a worldwide phenomenon. While no longer under the “Mighty Morphin” banner, the Power Rangers series still continues to this day with a a new set of Rangers every season, much like its Japanese counterpart. This new film, based on the original series and characters, displays the teens with such depth that one may assume this the tale of how the Breakfast Club became superheroes. We are introduced to Jason (Dacre Montgomery) , an all-star Quarterback for Angel Grove High who has recently lost his position and social status after a senior prank gone awry. He is joined in detention by Kimberly Hart (Naomi Scott), a former cheerleader, and Billy Cranston (RJ Cyler), an autistic, yet genius young man who is the frequent subject of bullying. After a chance meeting at an abandoned gold mine with two other social outcasts, Zack (Ludi Lin) and Trini (Becky G), the teens all stumble upon crashed spaceship containing Zordon (Bryan Cranston) and his faithful robot assistant, Alpha 5 (Bill Hader). Zordon bestows the responsibilities of the Power Rangers upon the teens, noting that they had been chosen by the “Morphing Grid”, a mystical energy field giving the teens the ability to take the form of the Power Rangers. Zordon has recruited the team to protect the earth from the wicked forces of Rita Repulsa (Elizabeth Banks), who in this version is a former Ranger herself, lost to the lust for more power. 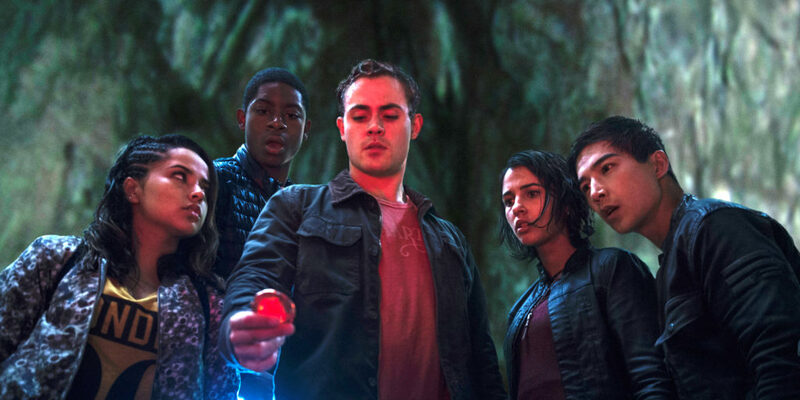 Dacre Montgomery plays the role of Jason with a strong perseverance and drive to lead his team as the Red Ranger, while Naomi Scott’s Kimberly (Pink Ranger) is given more of a mean girl persona. Ludi Lin plays Zack (Black Ranger) as a fun-loving daredevil without a care in the world, but is actually hiding his true pain and grief. Becky G’s Trini (Yellow Ranger) is the true outcast of the group, often quiet and introverted due to constant pressure put on her by her parents to be “normal”. The one ranger that stood out for me the most was RJ Cyler’s completely lovable and hilarious performance as Billy (Blue Ranger). In the original series, Billy was the typical nerd of the group, always working on tech problems or inventing new devices for the team. Cyler’s Billy follows that same basic concept, only the character is now on the autism spectrum, giving him incredible intelligence, but less than stellar social skills. While Elizabeth Banks gives a wickedly sinister performance as Rita Repulsa, one might say she was overlooked in the character development department. We are never really given a clear reason as to why she wants more power, just that she wants it. She spends most of the film seeking out and eating various portions of gold so that she may use it to create Goldar, a giant monster capable of mass destruction. Goldar’s character is also underdeveloped and contrary to the original series incarnation, but this bumbling brute does make for an exciting fight scene with the Rangers’ Megazord, a giant robot formed by combining each of the Ranger’s “Zord” vehicles. While not without it’s flaws, Saban’s Power Rangers proves to be an exciting, fun, and sometimes gritty interpretation of the franchise that all fans old and new should enjoy. Power Rangers opens in theaters everywhere Friday, March 24.